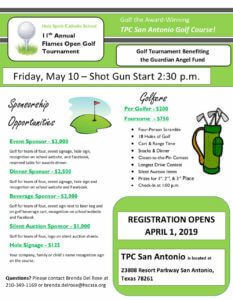 We invite you to support our Holy Spirit Catholic School Guardian Angel Fund by playing in our 11th Annual HSCS Golf Tournament. Please contact Brenda Del Rose for additional information and to be an event sponsor. Proceeds benefit the HSCS Guardian Angel Fund, which offers temporary financial assistance for families in need.